Mumbai, April 6 (IANS) Actress Janhvi Kapoor feels actor Pankaj Tripathi thinks she is a creep. Mumbai, April 6 (IANS) Megastar Amitabh Bachchan says his granddaughter Aaradhya likes to come and destroy his working desk, and that brings immense joy to him. Mumbai, April 5 (IANS) Actor Ayushmann Khurrana says his bushy eyebrows became an obstacle in his career initially. 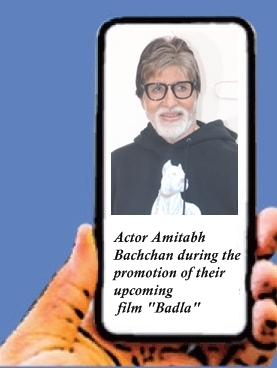 Mumbai, April 5 (IANS) If "Bobby Jasoos" actress Vidya Balan had to turn a spy, she says she would love to investigate megastar Amitabh Bachchan. Mumbai, April 4 (IANS) Superstar Salman Khan's sister Arpita Khan Sharma has called out a social media user for passing demeaning remarks about her son Ahil. Mumbai, April 4 (IANS) Bollywood actress and Congress candidate from Mumbai North Urmila Matondkar and Gujarat Patidar leader Hardik Patel will address a 'Mega Youth Meet' in Andheri here on Sunday. Mumbai, April 4 (IANS) "Yeh chappal kahaan se liya (Where did you buy these slippers from)?" Ranbir Kapoor took a paparazzo by surprise when he posed the funny question to him at the airport here recently. Singapore, April 4 (IANS) Filmmaker Karan Johar was surrounded by the love of his family and friends as he unveiled his wax figure here on Thursday.